This is the best low-carb flourless chocolate cake we make for all special occasions and I’m so happy to share this with you. It’s inspired from this Zuni Cafe flourless chocolate cake recipe I shared with you years ago, but I rearranged the ingredients for a keto friendly low carb spin. The original cake is made with ten ounces of dark chocolate and some sugar. I replaced both with Vahrhona Unsweetened Cocoa, Swerve and added in olive oil and tad of butter. There are two ways to add extra flavor to this cake; red wine or coffee. I make this decision depending on the topping I want to use and what mood I am in. Both work really well, but when you use wine, use a tablespoon more of the cocoa and make sure to use a very good cocoa powder because some cheaper brands are bitter. I use Valrhona Unsweetened Cocoa Powder. This is the best buy I have found on Amazon. 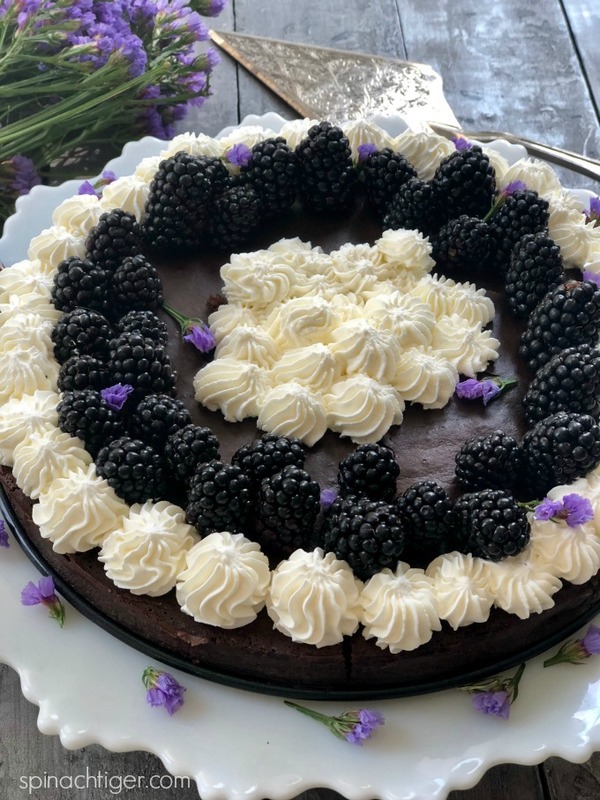 When I topped this low carb flourless chocolate cake with blackberries, I chose to use red wine and it worked splendidly. 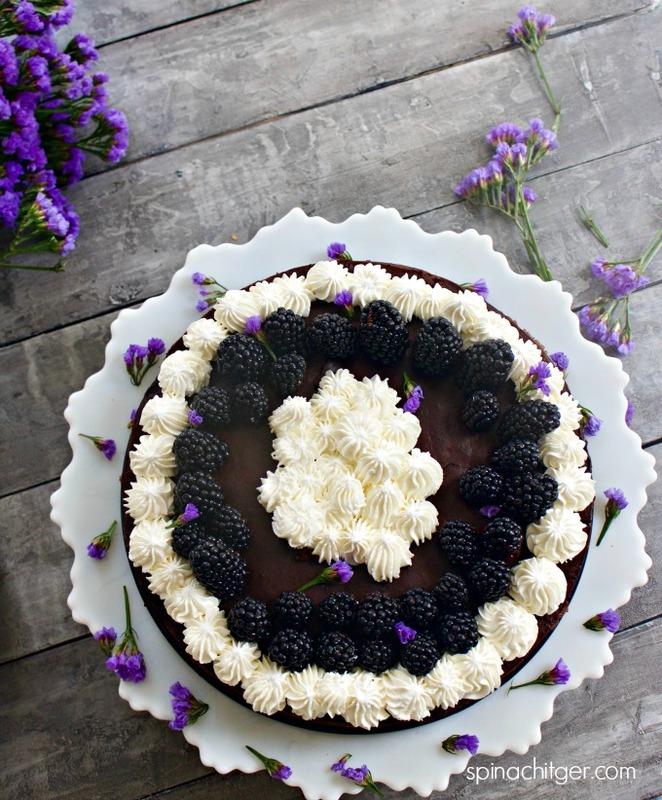 Did you know that blackberries love chocolate? 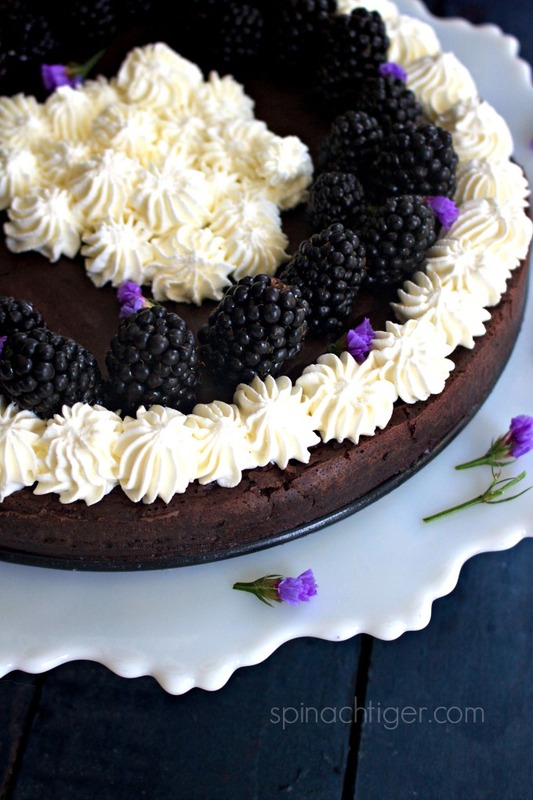 The darkness of the chocolate marries the juicy blackberries perfectly. When I use blackberries, I like to use a Merlot. On most occasions, I will use strong coffee or espresso, but not espresso powder. The coffee flavor boosts the chocolate and many chocolate cakes have a little coffee in them. This low carb flourless chocolate cake is high fat and keto friendly. The ingredients that holds the cake together are eggs and whipped heavy cream which is folded in at the end. Using five eggs plus an extra two egg yolks, you will want to beat this until creamy. The cocoa powder, swerve, coffee and olive oil are heated on the stove, just enough to be incorporated. Whipped cream will be folded into the mixture as the last step. The only tricky part of this is setting it in a water bath to bake. I do not recommend a bottomless pan. Even with tin foil, I found the water seeped through. It’s best to use a round cake pan lined with parchment paper, making sure you leave enough on the edges to pull up when ready to remove from pan. The water bath keeps the cake texture very light. You can bake it straight away without a water bath for a denser cake. I like using the water bath for that silky texture. Before extra toppings or fruit, the cake at 1/10 serving is approximately 3 nets carbs. That does not change with whipped topping but will change depending on what fruit you use. Chill thoroughly before serving. You can make Stabilized Whipped Cream in advance, place in a pastry bag and decorate once the cake is chilled or right before serving. I have made this flourless chocolate cake so many times, I have it memorized. This is a keeper and especially wonderful for those following a ketogenic diet, a diabetic friendly diet, or a low carb diet and still want to splurge for special occasions. Butter cake pan. Line with parchment paper, butter again. This ensure the parchment paper stays in place. Make sure the sides are buttered very well. Beat whipped cream until soft peaks form (not stiff) and set aside. I did this first and transferred to a separate cold bowl and then used my standing mixer to mix eggs and sugar. Mix eggs with Swerve (powdered erythritol) in blender or Vitamix for five minutes on medium. Put cocoa, olive oil, coffee, (or wine) in bowl over simmering water, until mixed. Set aside until egg/sugar mixture is ready. Fold ¼ egg mixture into chocolate mixture, stirring well. 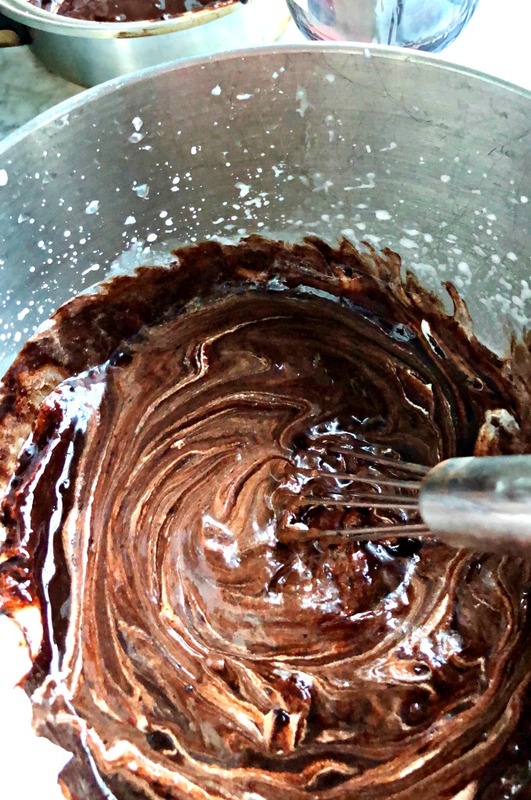 Fold this chocolate mixture into remaining egg mixture. Pour into prepared cake pan. Put cake pan into baking pan. Pour hot water up to 1 inch of cake pan. Bake at 350 F. degrees for one hour. Test for doneness when toothpick comes out clean. Turn off oven and keep cake in oven for 30 minutes with oven door ajar. Remove from water bath and allow cake to cool thoroughly before removing from pan. Serve at room temperature to retain that silky light texture. You can serve cold, but texture will become much more dense. I like it both ways. 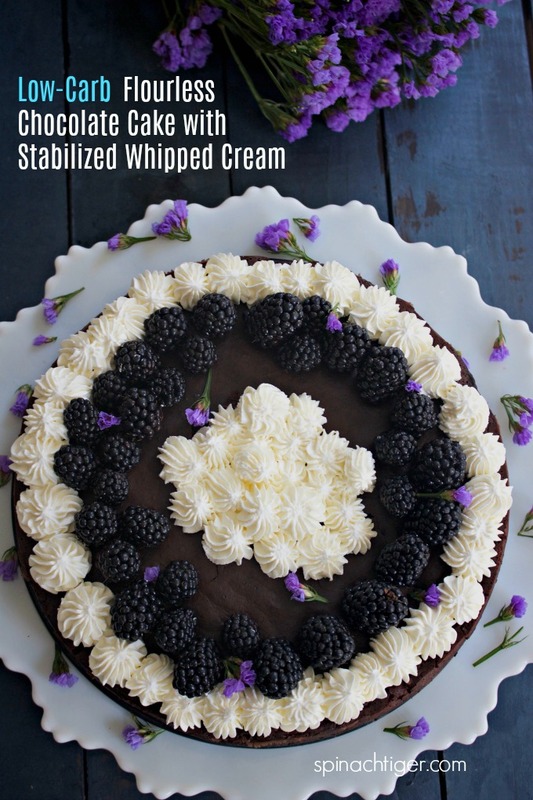 Serve with stabilized whipped cream. At 10 servings per cake, the cake is 3 net carbs. This is without topping or fruit. See Option in post for Using Dark Chocolate (brings cake to 10 net carbs). Replace ¾ cups powdered erythritol with 6 tablespoons powdered erythritol. I use Swerve. Eliminate olive oil and unsweeteend cocoa. (The cacao already has the fat content). Such a good tip with the water bath. Never would of thought of that. Excited to try this out!